Yesterday a friend invited me to see a wonderful exhibition: prints made from newly discovered glass negatives made by the photographer William Bullard. The photos are of people who lived in the Beaver Brook area of Worcester, Massachusetts, from around 1900 to 1912. They're predominately African Americans, but also Native Americans and immigrants--it was a vibrant, diverse community. Along with explaining who the people in the pictures are, the accompanying plaques included comments from their descendants. For some, these photos are the first images they've seen of their progenitors. In one case, a photo of a house and its residents confirmed longstanding family oral history that the house had been in the family--it's very moving to see/read about history rediscovered and affirmed. The liveliness and force of personality of the people being photographed carries through so clearly, just looking at them gives you an impression of having met them. If you live within traveling distance of Worcester, I highly recommend making a trip to see it before it closes (February 25). The reason I feel anxious when I dump off my papers in the paper recycling dumpster is because people like me will see interesting items and pull them out--as I did, yesterday. I was attracted by the fancy handwriting. The book in which it had been inscribed was falling apart, but I grabbed the first few pages to situate the dedication. 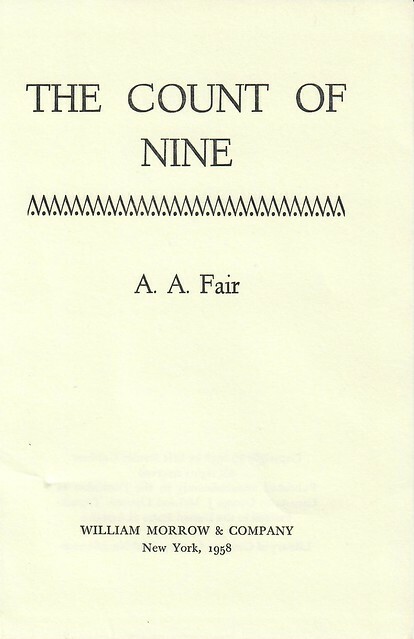 It might have been hard to decipher the name of the person who was making the inscription if it didn't happen to be ... the author of the novel! I thought the name "Erle Stanley Gardner" sounded somehow familiar--and a Google search told me that yes, indeed: he was the creator of Perry Mason and many other mysteries. 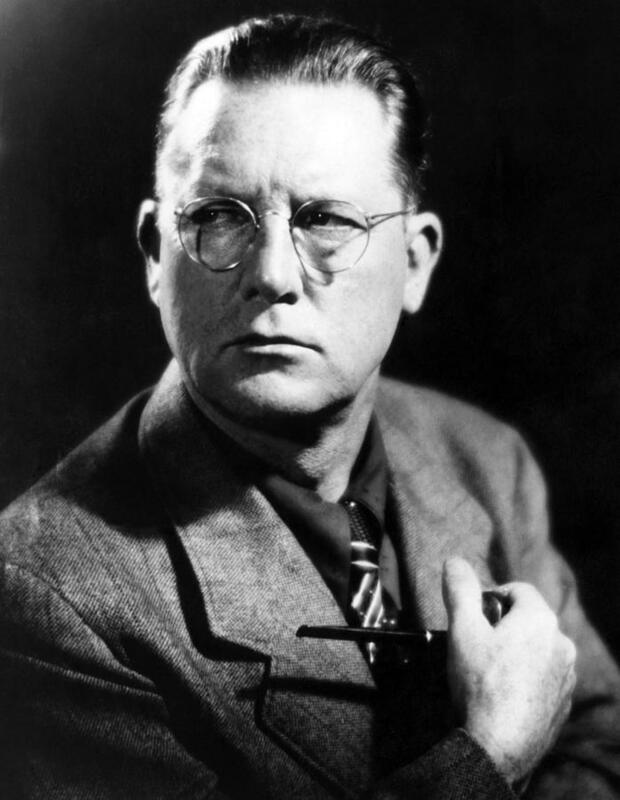 Regarding his writing, the Thrilling Detective website says, "Although critics sneered and many felt that Erle Stanley Gardner was not a very good writer ... Gardner was one of the best selling writers of all times, and certainly one of the best-selling mystery authors ever." Capt. Frances G. Lee -- Trooper Gardner reporting. 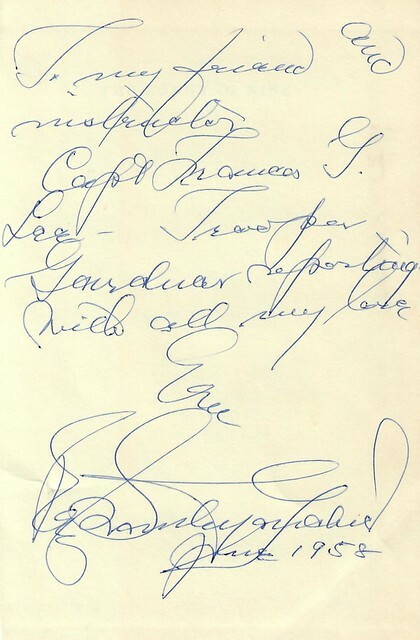 So who was Captain Frances--female spelling--G. Lee? Well! 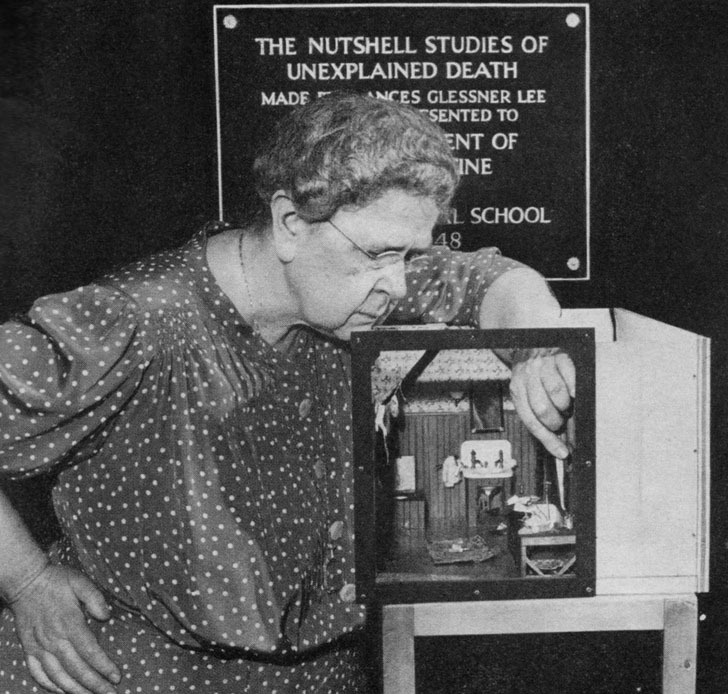 She turns out to be Frances Glessner Lee, whom Wikipedia tells us is the "mother of forensic science"! She had to wait until she was 52 to embark on the career for which she became famous, but at that point she inherited a fabulous fortune that enabled her to pursue her studies and endow departments of legal medicine, police science, and a library. Further, Wikipedia tells us that "for her work, Lee was made an honorary captain in the New Hampshire State Police in 1943, making her to first woman to join International Association of Chief of Police." 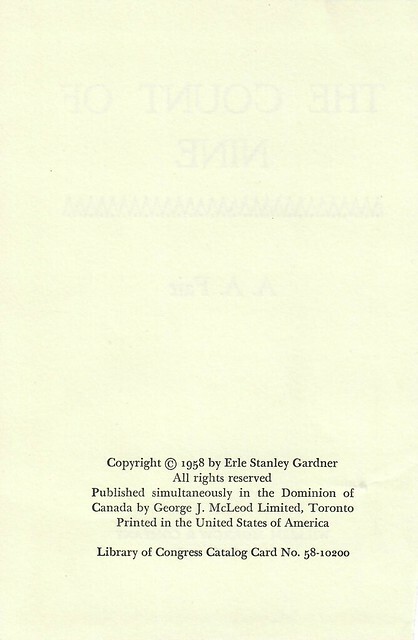 And, Erle Stanley Gardner dedicated several novels to her. ... and somehow one that he'd sent to her himself, with an inscription, ends its life in a recycling dumpster in my town. I wonder who owned the book? In any case: not your everyday find! 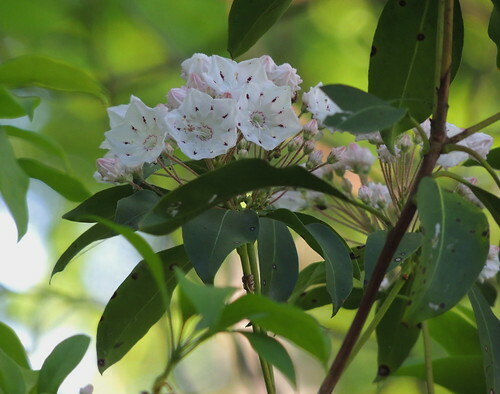 When I was telling my father about the fish elevator and all those shad, he told me that he'd learned from a friend that mountain laurel, which blooms around now, is known as "the shad tree"--because when it blooms, that's when the shad run. 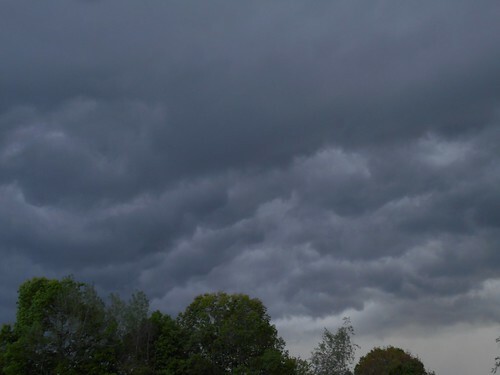 Yesterday afternoon this dramatic sky was up above the Aquavitae portion of what's known as the Great Meadow of Hadley, Massachusetts. 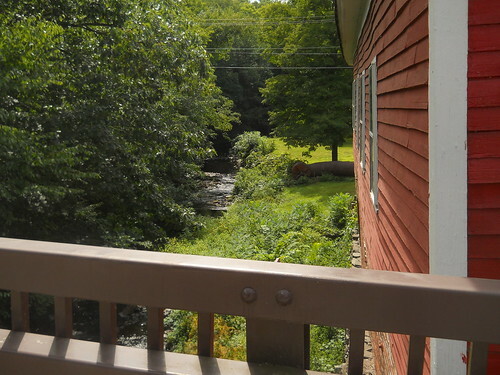 I had always wanted to go down Aqua Vitae road--I remember when last the Connecticut River rose and flooded it. Some of the houses down there are on stilts (wise move). Just think: 350-plus years, these fields have been tilled. Can you see the different colors of the ground? Those are the different fields. Back in the earliest days, the Aquavitae area was planted in hay, and other parts of the Great Meadow were planted in wheat, oats, rye, and corn, as well as peas and barley. As you can see from the cut stalks, corn is still grown there. Tobacco, a crop that caught on in the area in the 1800s, is still grown there, too. These horses haven't been here anywhere near as long. See the Connecticut River behind them? The horses were frisking with each other until I came up. 1Patricia Laurice Ellsworth, Hadley West Street Common and Great Meadow: A Cultural Landscape Study, 2007, p. 10. On Christmas, wakanomori took me to see a decrepit old bridge over a rail trail, and I had the fun of walking across it on the sturdy steel beam (and clutching the steel sides). He posted photos, but his account is locked, so with his permission, I'm sharing some here (i.e., these are all his photos). Probably the family itself doesn't have the funds to restore the building, and maybe public monies aren't available. Probably there's some grant out there somewhere that could be applied for, but it would take someone willing to make that effort, and the family being willing to accept it. Searching for more information, I found text from a tour of historic buildings in the area, which says that the land was deeded to John McCoughtry by Stephen van Rensselaer. As you may know (Bob), New York State was originally a colony of the Dutch. The van Rensselaer family were important landowners from those days. 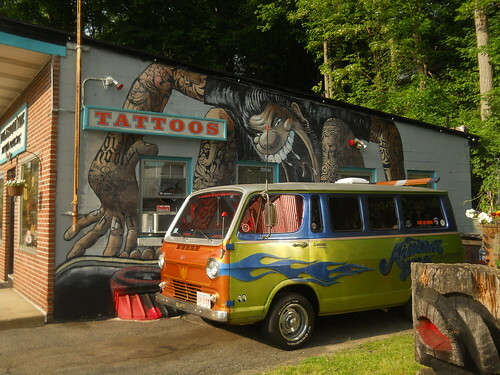 Just over the border at the south end of town is a tattoo parlor with some great associated art, including a series of circus-poster-style portraits of various random famous people that the artist must admire. Here is Marilyn Monroe as a tattooed lady--she has JFK on her left shoulder and the legend "Enter if you dare" on the ribbon underneath her. 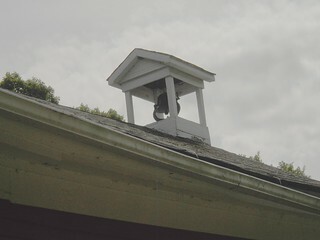 The bell apparently went missing in the 1960s, only to be found in 1974 ... in the bell tower. Surely more to that story there than meets the eye . . . 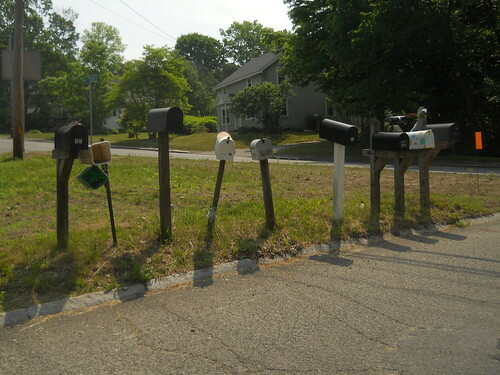 Meanwhile, closer to home: these mailboxes. Are they waiting in line for something? Or are they part of a parade that's temporarily stopped while a band performs for the judges? Or are they just loitering? They had better watch out, if so. I'm told the police take notice. The night before I left for Sirens, wakanomori had the pleasant job of introducing a Japanese storyteller who was performing at the local university. She does traditional rakugo storytelling, plus original stories, in English. I asked Wakanomori what they were like, and he told me one of the traditional ones she'd told. It was so entertaining I thought I'd share it here. I listened to a couple of Japanese versions of the story, so what you're getting is Motoko-Wakanomori transmission, influenced by those two linked storytellers. 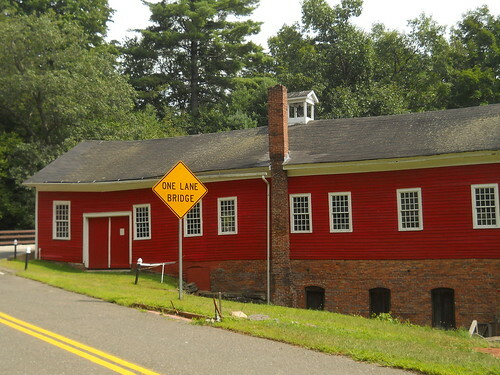 So here is the bright red mill building--Aldrich Mill--which we passed on our way to the dino tracks place last weekend. Look at its lovely foundations. 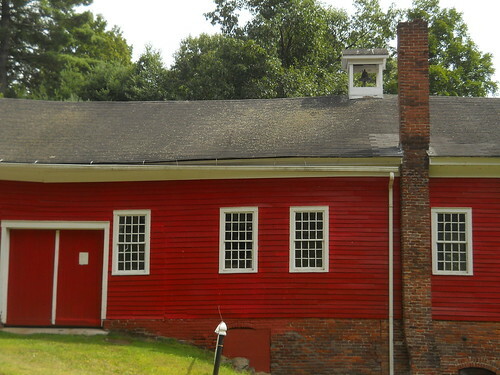 . .
Why did the mill have a bell? Maybe for calling people to work? In the 1940s, a water wheel was added, but never used. 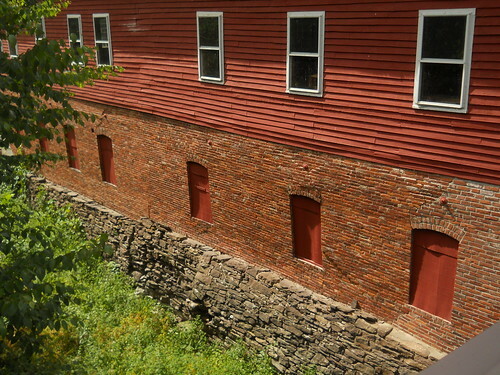 The water wheel isn't on anymore--at least, we couldn't see evidence of it--but here's a picture of what it looked like. It's still owned by the Aldrich family, according to Mr. Nash. 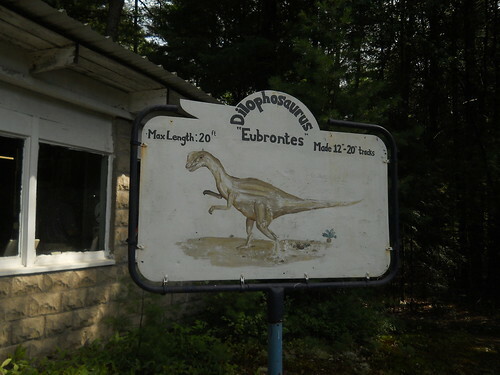 My neck of the woods turns out to be one of the best places in the United States to see dinosaur footprints. Not bones, but footprints. Who knew?! But it's true. 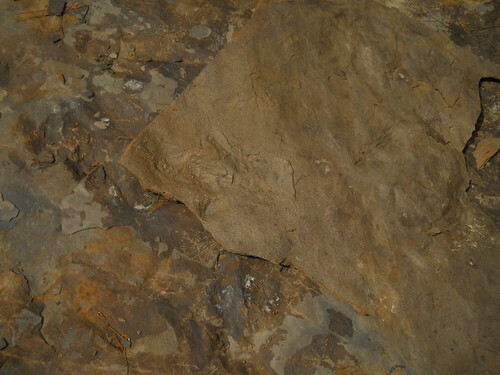 I've known for years that there was a rather idiosyncratic, privately run place nearby ("Nash Dinosaur Tracks") where one can see dinosaur tracks, but I'd never been. But this weekend, wakanomori and I went there, and it was fabulous. 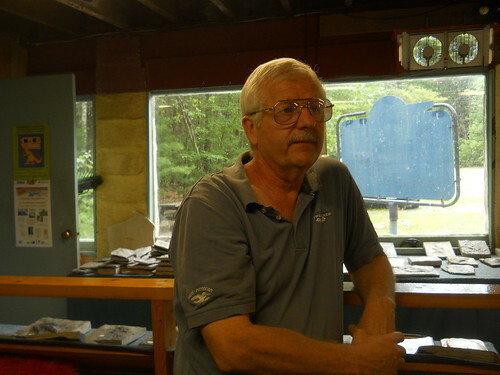 Kornell Nash, the current curator, is the son of Carlton Nash, who bought the site in 1939 and ran it until his death in 1997. 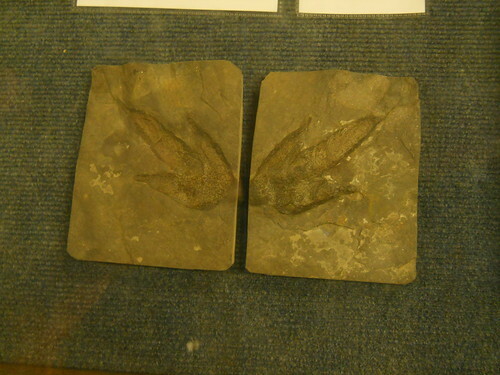 He told us that a farm boy with the magnificent name of Pliny Moody found the first dinosaur tracks in 1802. He brought them home for a doorstep to his family home,1 and then when he went off to school, he sold them to a doctor, Elihu Dwight, who told the neighborhood children that they were the tracks left by Noah's raven when he was sent out to look for land after the flood (Noah's raven must have been much larger than the ravens we have nowadays... an antediluvian raven). 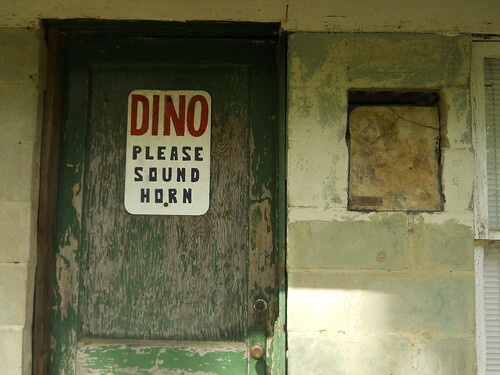 Mr. Nash's father grew up near the Moody homestead and was fascinated with dinosaurs. 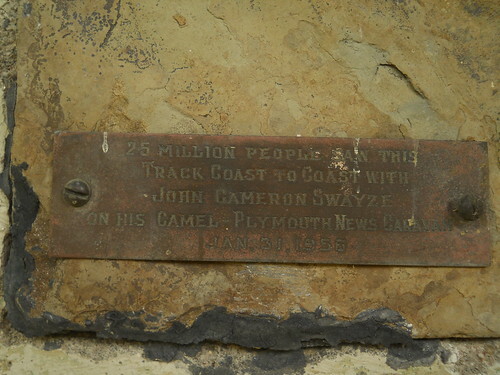 In 1933, a year out of high school, he discovered some tracks while prospecting. In 1939, he bought the land he'd found them on. 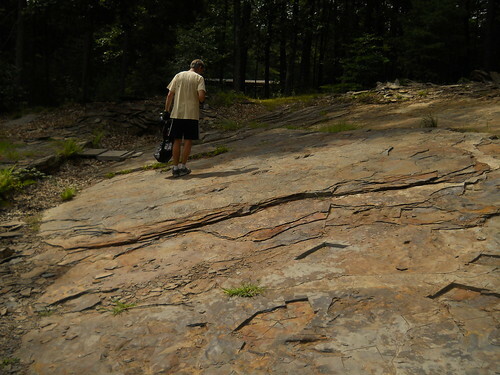 After we talked for a while longer, Mr. Nash let us wander out in the quarry area where to this day he cuts out tracks--and not only tracks: also fossilized fish and wood. This painting, at the front of the establishment, was painted by an enterprising Hampshire College student who came calling, asking if she could do some painting for him. The website has a page devoted to past signs and paintings here--they're quite fun. Mr. Nash also knew lots about local history, including about a beautiful mill building we had passed on our way over--but I'll save pictures of that for a separate entry. How many years in the future is your story set? But other things really stick around--like religions. Go back a thousand years, and the big players that we've got on the religious field today were still there. A THOUSAND YEARS. ** And not nation-states, but senses of peoples--they're tenacious, too. Tribalism I guess is the negative-connotation word for this. I think of this, because some of the things authors want to get rid of by setting novels in the future are things like particular religions or national/tribal identity. And the truth is, I can pretty much accept that, if the story catches me up. It's only when I look at history that I get to thinking about plausibility and implausibility. **It's true that how religions or the sense of being a people manifest themselves change--flavors of Buddhism or Christianity in 1015 was a lot different from those flavors in 2015, and that leaves lots of room for fun imagination. 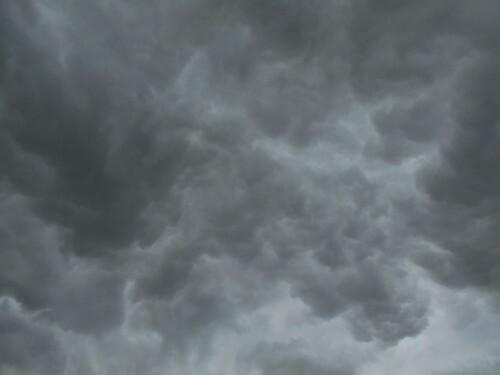 But the actual thing itself doesn't just disappear. Even religions that are no longer actively practiced remain alive culturally.